One of the qualities of street photographers, notes Joel Mayerowitz – one of the great practitioners of the art – is that they are both gregarious and solitary. They are gregarious because they like to go out and be among other people on the streets, but they are also solitary in that they generally keep their distance and try to be unobtrusive. So it must have been for Vivian Maier, unknown in her lifetime, but now claimed by some as one of the great street photographers. In order to appreciate whether an expression is worth capturing, a photographer needs to have some understanding of the humanity behind it. Maier clearly had this understanding, but paradoxically she seems to have spent much of her life alienated from people, especially so as she grew older. Finding Vivian Maier tries to uncover who this woman really was. Maier died in 2009, aged 83, and completely unheard of in the world of photography. Two years earlier, out of financial necessity, many of her belongings were auctioned off, including thousands of negatives and hundreds of undeveloped rolls of film. John Maloof, co-director of this documentary, was one of the buyers. Unfortunately, this film makes no mention of the fact that there were two other buyers, Ron Slattery and Randy Prow (in fact, they purchased various boxes and suitcases, not knowing that they contained any photographic works). This has given rise to some controversy, including the suggestion that Maloof is trying to glorify his role in Maier’s story. Maloof himself declined to take part in a BBC Imagine documentary last year, called The Vivian Maier Mystery. Finding Vivian Maier is presented as a detective story, beginning with the discovery of the negatives and films and then following Maloof as he tracks down and interviews people who knew Vivian Maier. Her story is undeniably fascinating, though this is as much because of the unanswered questions that remain as for the things we now know. Maier was a tall woman with somewhat angular facial features, who wore figure-concealing clothes and large boots. She worked as a nanny, which seems to have given her the freedom she desired to obsessively pursue her photographic interests. One of the children she nannied says they used to refer to her as “the wicked witch of the west”, and in many of the photos of Maier – including her own self-portraits – she often looks quite severe. However, in pictures where she is depicted smiling her features seem to soften and she struck me as really quite beautiful. As far as we know she never had an intimate relationship. Some of the mystery about Maier, as presented in this documentary, seems to be less about her and more about the faulty memories or differing perspectives of the interviewees. At one point, a big deal is made about the French accent that she had. Was this real or affected? One acquaintance swears it was real whilst another, a linguistics professor who wrote his thesis on French speech, assures us it was faked. Only after we are presented with this discussion do we learn that Maier in fact spent many childhood years with her parents in France. So even if she occasionally “turned up” the accent a bit, it was undoubtedly based on actual experience. What therefore was achieved by presenting us with the conflicting opinions, other than making a linguistics professor look foolish? In another segment two sisters who had been nannied by Maier disagree about the way she took photographs in the street. One swears that she never posed her subjects, whereas another says she always posed her subjects. But a glance at her photographs shows that there is no mystery: some were clearly posed and others were taken surreptitiously. 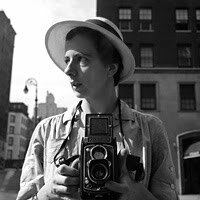 What remains fascinating and unanswered about Vivian Maier, however, is the nature of her personality. There are differing accounts from the children she nannied; some found her delightful, others say they were bullied. She didn’t care for men and seemed frightened of them. One interviewee speculates that she might have been abused. Maloof reports that all the family members he traced were incredibly private people and disconnected from each other. Whatever laid behind Maier’s personality, it does seem to be the case that at some point mere eccentricity began to tip over into something darker. As Maier became more alienated from people she also became more lonely. As a photographer who occasionally dabbles – mostly badly – in street photography, I became aware of Maier and her photographic work sometime last year. Shortly after, I spoke to a “name” street photographer who asked the question: “But is she any good?” He thought that she probably was, but he ventured that it was difficult to evaluate her work separately from the mystery surrounding her. A similar point is made by one of the interviewees in this film, who says “I find the mystery of it more interesting than the work itself”. Sadly, Joel Mayerowitz and Mary Ellen Mark are the only two photographers who venture any opinion on Maier’s work. In many ways Finding Vivian Maier is a good documentary film. The pacing is good, the telling of the story works well, and the music unobtrusively suits the mood throughout. However, there is a nagging feeling of dissatisfaction that comes from the knowledge that two other owners of Maiers photographs have been written out of this story. Thanks for the response Chuck. For anyone in the UK, or with access to the BBC, the BBC’s film is going to be shown again at 23.05 on 5th August, on BBC1.